I love Remembrance Day. I love the tradition, the sentiment, the parades but most of all I love the pride it gives me in my country and now in my job. I was a St John Badger as soon as I was old enough to go. ‘Mummy I want to be a doctor’ I said so Rainbows and Brownies was put aside and off I went to be a Badger. Every year we’d line up in our uniform, proud as punch (and freezing cold!) to march around the town. My home town had a beautiful square to march in with the memorial in the middle, surrounded by shops. It was lovely, the whole town turned out before we crammed as many people into church as would fit for a service. My older brother was in the Army, my Grandads both were during the war. It was a proud time; I didn’t miss a parade in 14 years. I love the pomp and circumstance and the invisible current of meaning you get, even aged 5, stood watching the veterans and then the sadness hirs when you realise, many years later, how you’re closer to the front of the parade because more are passing on. How much it means to them to put on their medals and uniform year after year, to still be here, to remember their friends and relatives and people they never knew but all of whom died in thecause of our country. 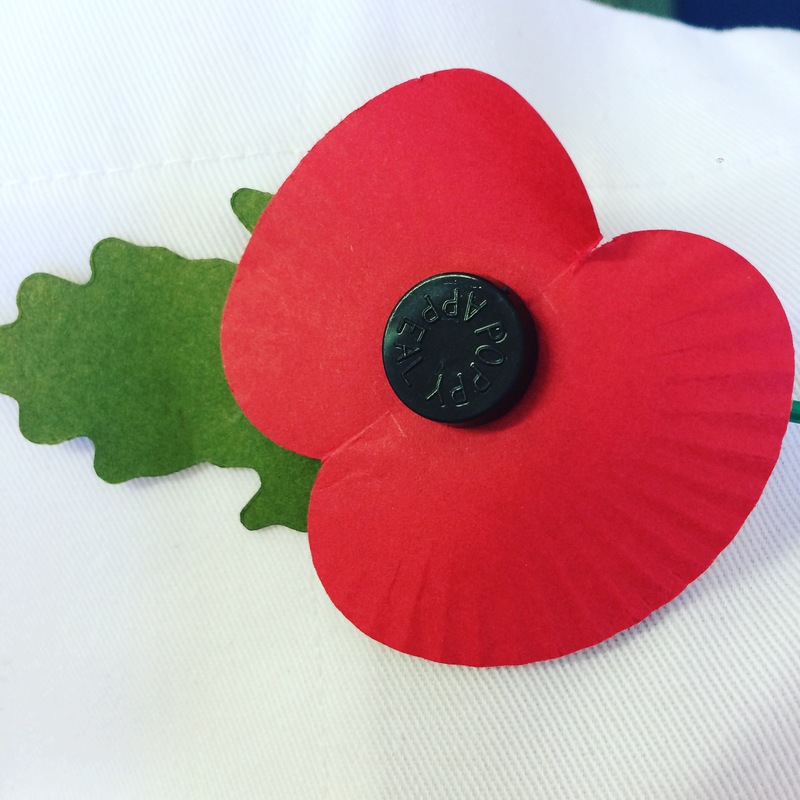 I was so proud (and nervous) to be chosen to lay the wreath one year, it was a huge honour to me. Aged 18, not getting the A levels I needed for medicine I decided to join the Army. Ten years on and I still haven’t missed a parade and at nearly two neither has Baba. It’s a tradition I shall encourage in her. I know there’s discussion over the usage of the poppy, over the symbolism and there’s skepticism of the two minute silence. How we should show respect all year round. I do. But in the hustle bustle of every day life it’s forgotten and not acknowledged. There’s no meaning to constant but not publicised respect. I know I do, but without a focused point it’s not something I acknowledge or think about daily, yet once a year I’m reminded of that chance. Remembrance Day to me is not about whether we should or shouldn’t go to War. It’s about an opportunity for remembering with others, for thanking and respecting those who’s lives have been touched by it both now and in the past. Paying tribute to the past to encourage perhaps a better future. One of my greatest priveleges was attending the daily service at the Menin Gate. The Last Post sends shivers down my spine every time I hear it; there it was almost magical. The heavy sense of something deeper at work just hits you, the emotion is immense and I’m not ashamed to admit I cried. The horrors of war should never be forgotten over the argument it shouldn’t have happened. Baba was as well behaved as you can perhaps expect a 22month old asked to be silent and sit still could be. Attention can only be kept for so long; she doesn’t understand the importance and significance yet but I hope in the future she’ll come to love it as much as me. Not the suffering. Not the hardship or the loss. But the pride at being part of something great. And I hope she’ll be proud of me.